"Lady Macbeth, the early Scottish noblewoman, justifies ill will: she has seen good will as a hindrance to her purposes. Always,, ill will has been looked upon as more favorable to ambition than meek good will, so given to considering what is due to others. As the gravedigger in Hamlet might say, 'Your consideration of other people not yourself thwarts your lofty endeavors.' Well, Lady Macbeth knows good will accordeth not with ambition." Mr. Siegel is the greatest friend to every wife and husband, and I love him. In lessons and classes taught by him, my contempt and ill will were criticized, and I learned that the one ambition that makes a woman self-respecting and happy is the ambition to have good will—for one's husband and the world, people close and far away. Because I learned this I had a very happy marriage with the late Sheldon Kranz—a marriage which is a means of education to wives and husbands everywhere. 1. Does a Wife Want an Accomplice or Creative Encourager? "Marriage is a means for liking the world through a person. Too often, though, marriage is a contemptuous exclusion of the world." There Are Wives has seen that this second, ugly ambition—to exclude the world contemptuously— works in many ways in wives. Since when a woman marries, she has likely already come to be against the world, it follows that she will want her husband to join her in fighting or getting rid of that world. Many a wife has assumed that her husband’s purpose is to make her more important than anything, and she feels that together they’re more important than all other people. All of this happens without any overt statement or declaration; we accrue contempt in marriage the way dust accumulates under a sofa; quietly. And it has results. is a quick way of settling matters in life. The desire to annul is the miserable flower of contempt. Sheldon Kranz. As my creative encouragement. Eli Siegel. Then you’ll be different from most husbands. That word “accomplice”—how terrible and how fitting it is! For when a wife and husband don’t have as their conscious ambition to use each other to like the world, to see meaning in it, to value people truly, they are committing a deep crime—and causing themselves great unhappiness. Every time we have contempt, we rob the world of meaning, and rob the very person who may be our accomplice. Today, when marriages are suffering tremendously from economic hardship, when men and women are so worried about putting food on the table, providing clothes for their children, every couple needs to learn this. 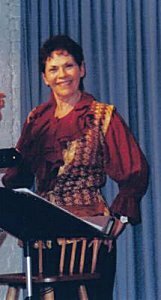 Jackie Morrell. It doesn’t happen every night. There Are Wives. However often it happens, it’s contempt, and it takes the life out of marriage. If we count up all the time we spend in a day thinking things don’t matter so much—other people’s feelings, our husband’s worries, objects, what is happening in the world—everyone here would have an astounding amount of minutes and hours in which reality is robbed, is given less meaning. You can ask yourself: Last Tuesday, at about 6 PM, when you had contempt, did it hurt you—as well as your husband? Jackie Morrell. I didn’t think of it that way. There Are Wives. People don’t We like to pad our contempt, and say, “It’s just a little instance of selfishness, what can that do?” But we live minute by minute, and meaning is either welcomed minute by minute or it’s extinguished. Eli Siegel. It is a tendency of humanity—again and again people have, consciously or unconscious, used themselves o shut the rest of the world out. It’s their greatest victory and their greatest defeat. Eli Siegel. The last stronghold of anti-world feeling is one’s wife or husband and oneself. Ms. Fielding feels she’s an accomplice in this, and she’s condemning herself. 1. We feel we are untrue to ourselves. 2. We feel the other person is not interested. 3. We feel the other person is also untrue to herself or himself. Made his lady wash her hands. “Is anyone here like Lady Macbeth?,” we asked in the Understanding Marriage class. “Of course not. The Macbeths murder people, and we don’t do that.” Yet, when we quietly extinguish the meaning of another person in our mind, what are we doing? When we, in the privacy of our boudoir, say “killing” things about the friends we have just left at the party, what are we doing? And when, as Mr. Siegel said in the lesson, we use our husbands to shut the rest of the world out, what are we doing? Looking closely at the play, we see that the Scottish wife is only, as she sees it, trying to be happy and have a good life for herself; and like many wives she feels the man she married is too sluggish to make it on his own; he’s too easy-going, doesn’t have enough get-up and go; is too soft-hearted. 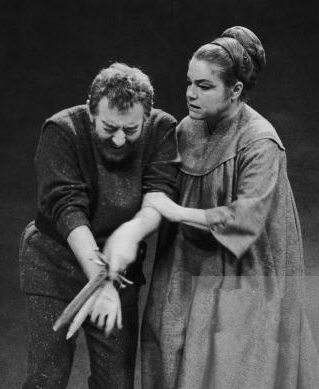 From the moment she hears, in a letter from her husband, about his meeting the three witches and their prediction that he, Macbeth, will be king, Lady Macbeth’s ugly ambition accelerates, and she says, in effect: Take away all feeling from me: I have to manage! At that moment the opposites of being affected and affecting, of yielding and assertion, of gentleness and hardness in her, are told to despise each other. 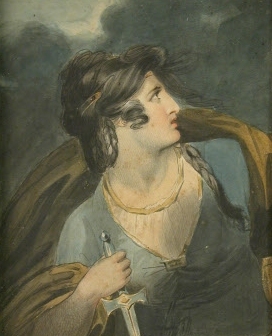 “Leave all the rest to me,” she tells her somewhat doubtful husband, as she eggs him on to kill Duncan, the king, who is their honored guest; and when Macveth says he can’t go through with it, like many a wife tonight who wants her husband to get ahead in business, she prods him, saying contemptuously, so why did you bring it up in the first place? When you durst do it, then you were a man! This is the wife whom Macbeth has called “My dearest partner of greatness,” and, endearingly, “my dearest chuck.” So they talk; and she works on him; and he listens. The question asked of my husband in the lesson I quoted earlier: “Do you want to use [your wife] as your creative encouragement or your accomplice?”—is a question this husband is never asked. A husband and wife can make fun of the other deep in his or her mind; and the culmination may be a blankness of feeling, terrifying in its vacuity. That is a question which is beautiful in its terror. 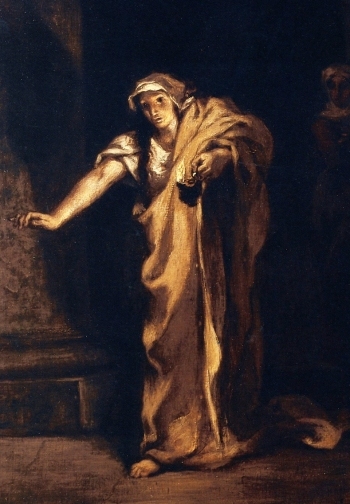 The opposites of affecting and being affected, of hardness and softness have changed hands; and after all her managing, something now is running Lady Macbeth—beyond her control. Aesthetic Realism says, as soon as you want to use a person to have a world apart, you’re at the beginning of ordinary misery and extraordinary horror. come, come, give me your hand. What’s done cannot be undone. So what will have it change? The answer is: the necessary and grand study of what it means to like the world through another person. Suppose at night before you went to sleep, and your husband wants to talk, you speak together about the people he works with, what are they concerned about, what did you both like that day, what you are both hoping for from yourselves tomorrow—do you think as the weeks went on there would be more meaning between the two of you? Jackie Morrell. More meaning. I’m grateful to see this. Her gratitude stands for me and women everywhere—because to be able to learn how we may have ambition of a false kind and interfere with our own happiness, is the beginning of a tremendously important change in the direction of our thought and our life. That is why the study of Aesthetic Realism is what the wives of America and the world are hoping for!